Deepcool debuts the Multi Core X6, a new laptop cooler with a MSRP of 24.99EUR. 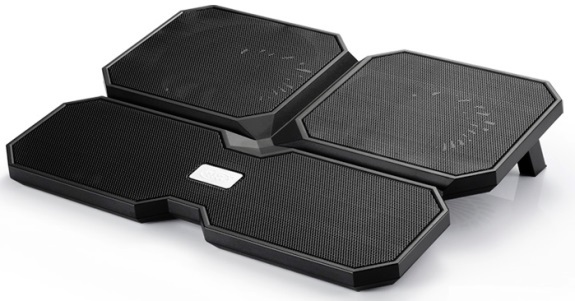 The cooler has a quite unique design, it consists of four pads, two with a 140mm fan and two with a 100mm fan. The cooler measures 380mm x 295mm x 24mm, it weighs 900g and is designed for coolers of 15.6" and below. The four fans provide a maximum combined airflow of 121.4CFM at a noise level of 24dBA. Deepcool,the leading manufacturer of a wide range of computer cooling products, announced its powerful multi-fan laptop cooling pad – Multi Core X6, the upgraded 4 fans notebook cooler. 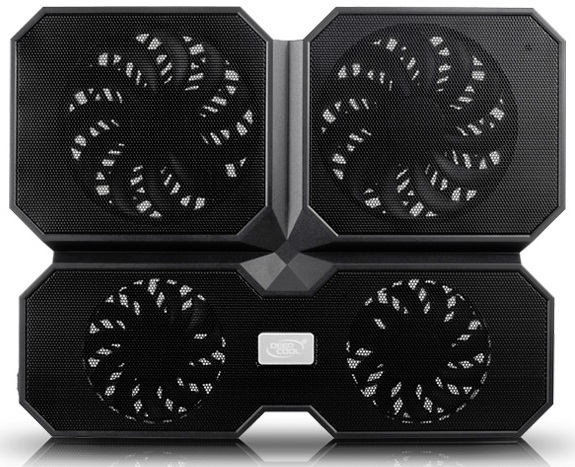 Multi Core X6 applies dual 140mm fans and dual 100mm fans with fan 4-status control. The black butterfly appearance of Multi Core X6, for highlights the dual 140mm and dual 100mm fans combination more perfectly, and for reflects the superior cooling performance better. Multi Core X6 chooses a more prudent classic black so that making the clever butterfly and strong wind perfect integration. Multi Core X6 breakthrough in traditional notebook cooler who applies for dual 100mm fan and dual 140mm fans for the first time, a single fan speed up to 1300RPM, 4 fans operating at the same time ensures high cooling performance. Luxury 4 fans gives strong wind to meet the cooling requirements for the hot notebook computer, also the 4 fans can cope with low power consumption well. Multi Core X6 using 4 fans with fan working status control in the industry so that users can arbitrarily control the cooling level according to the notebooks' heating area condition and the power consumption. Multi Core X6 is considerate because it has two different using angles, you may select your own one according to your feeling of ergonomics. Multi Core X6 carries standard USB interface to meets the multi USB device users’ mass demands, USB interface "in" and "out" in order to avoid using the notebook original USB interface.